As a professional with influence over the customer experience your business provides to your customers, you likely have a sense of which organizations are getting it right, whether they're your direct competitors or sources of inspiration in another line of business. While you can try to mimic, replicate or establish your own benchmarks to measure against based on these success stories, there's nothing more valuable than hearing how it's done directly from the pros. 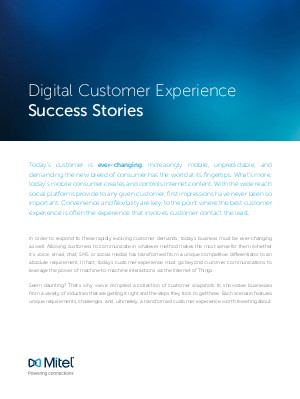 Check out our free e-booklet to learn from six companies that transformed their digital customer experience and saw measurable results in customer satisfaction, operational costs, employee productivity, and more.